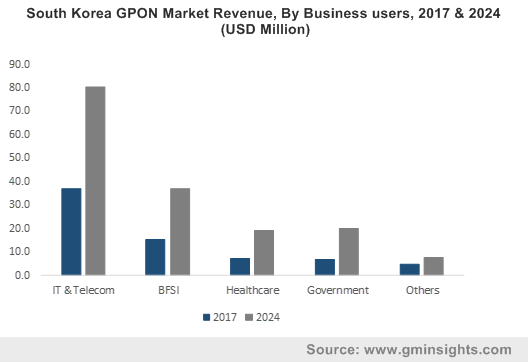 GPON Market size surpassed USD 8 billion in 2017 and is set to grow at a CAGR of over 9% from 2018 to 2024. 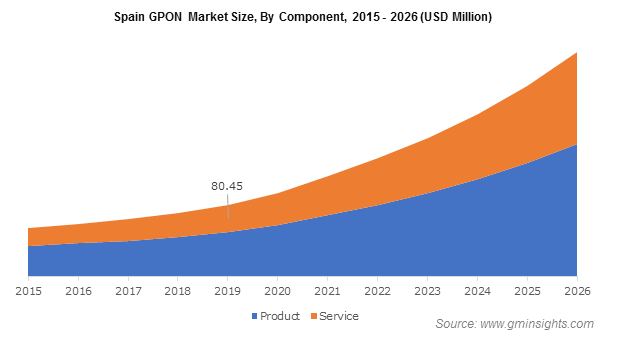 The GPON market is projected to exhibit an accelerated growth between 2018 and 2024 as it provides end-users with the ability to consolidate several services onto a single network, thereby reducing capital costs while increasing the bandwidth availability. It delivers a customizable and high-capacity fiber network for various IP-based services. These solutions are rapidly being deployed globally in optical access networks to achieve cost-effective speed upgrades and flexible fiber deployments. GPONs offer less costly connections than a standard Ethernet. By using a single fiber cable to serve up to 32 users, the need for hardware decreases. This reduces the cost and space necessary to host larger amounts of hardware to support the network. Also, the technology implementation involves fewer electrical and moving parts than in the standard network. This lowers the risk of downtime that might affect the productivity of administrators and network consumers. GPON fiber is a fraction of the size of traditional copper cables, thereby utilizing less space to run the cabling through a structure. These features make GPON a preferred choice for CSPs for deploying HTTP networks. 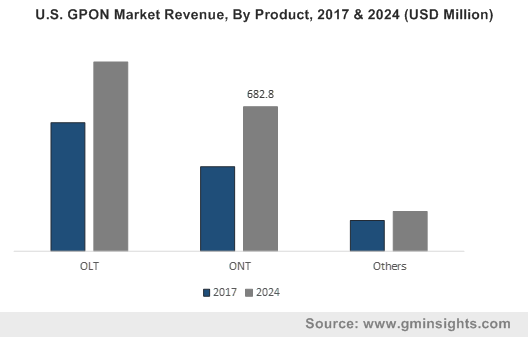 The ONT component segment in GPON market held a share of around 30% in 2017 as it is considered an essential hardware device installed at the user’s premise, which converts optical signals to electric signals that are forwarded to residential and business users. OLTs act as a demarcation point of the GPON service and are connected to the OLT through the PON. The growing number of users availing voice and data services through fixed broadband networks will fuel the ONT market growth over the forecast period. Managed service segment in the GPON market is projected to exhibit an excellent growth with a CAGR of over 11% between 2018 and 2024. The growing IT infrastructure of CSPs and the rising requirement among enterprises to manage and secure their networks is estimated to be one of the major factors driving the market growth. The 2.5 GPON segment held a major market share of over 60% in the technology market in 2017 as it is a traditionally preferred technology to deliver fiber-based fixed broadband connectivity. The technology is projected to maintain a dominant share throughout the forecast timeline due to an extensive support infrastructure and huge investments made by the major CSPs in the technology. Another factor accelerating the 2.5 GPON market growth is the increased shipments of compatible ONTs for accommodating the growing number of subscribers on existing networks. The FTTH segment in the GPON market is estimated to hold the major share of over 40% in 2024 due to an increasing household broadband penetration along with the growing demand for modern services such as triple-play and on-demand digital entertainment. A rise in the adoption of fiber connections and the need for improved internet infrastructure to satisfy bandwidth requirements will propel the market growth. Rapid industrialization taking place in the developing countries also opens up new growth opportunities for the telecom sector to provide high-speed internet to commercial users. As FTTH networks deliver high bandwidth capabilities, network and service providers are exploring the next-generation value-added services capable of generating new revenue streams. The business-level adoption in the GPON market is projected to witness the highest growth rate of over 10% from 2018 to 2024. As enterprise networks are undergoing disruptive changes due to the growing use of enterprise-level business applications, they are using a Passive Optical LAN (POL) based on GPON technology to reduce the total cost of ownership during the transition. Among business segments, the deployment of next-generation broadband connectivity technologies is experiencing a speedy uptake across the BFSI sector. To stay profitable and to grow in the new-age digital economy, banks are switching to the high-speed broadband networks to maintain the consistency of their service delivery. The next-generation GPON technologies such as XGS-PON and NG-PON2 are being deployed by banking and financial organizations to provide a robust broadband connectivity to efficiently serve their customers with real-time engagement for various types of financial services. North America GPON market is projected to hold a majority market share of over 20% by 2024. The market growth is attributed to factors such as the huge deployment of the FTTH networks to deliver high-speed internet services including video conferencing and VoD. The region also has the huge concentration of major networks and service providers that are investing heavily in the installation of next-generation GPON architectures. Major investments from the government and private sectors for the early commercialization of 5G networks are expected to generate an additional demand for next-generation GPON technologies enabling advanced mobile backhaul networks. The competition in the GPON market is characterized by large-scale investments in 5G networks to meet high bandwidth and low latency demands. For instance, in March 2016, Verizon invested USD 5 billion to advance its networks to provide clients with improved coverage and fast speeds. The company also focused on deploying new small cell sites and Distributed Antenna Systems (DAS) in locations across the U.S. To support the vast amount of data transferred over networks through internet applications, next-generation GPON technologies are expected to witness a significant demand over the forecast timeline. Broadband service providers focus on innovating their broadband offerings by providing high-bandwidth connectivity to their customers at competitive prices. They are modernizing their networks to offer innovative services to their customers and to gain more market share. 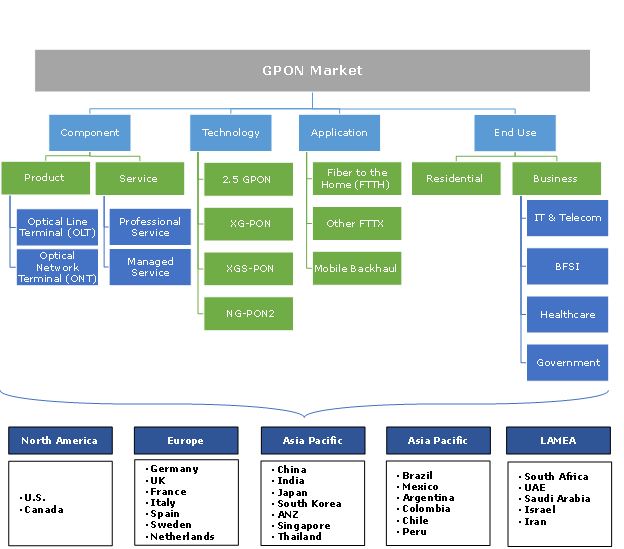 Some of the major players operating in the GPON market are ADTRAN, Alphion, AT&T, Broadcom, Calix, Cisco, DASAN Zhone, Ericsson, FiberHome, Hitachi, Huawei, Iskratel, NEC, Nokia, NXP, Semiconductors, Tellabs, Verizon, ZTE, and Zyxel. The growing demand for next-generation networking technologies to satisfy bandwidth requirements across various enterprise networks has increased the market growth for the GPON technology. A massive adoption of the PON technology by the businesses & residential users and the huge investments in testing 5G-ready networks will fuel the demand for XGS-PON and NG-PON2 technologies over the forecast timeline. The NG-PON2 networks offer a high downstream bandwidth as they combine multiple wavelengths to support bandwidth-intensive applications in residential and business applications. Several benefits associated with the deployment of these networks make them preferable networking modalities among CSPs.